Extend TOPdesk capabilities with RES to automate the entire user request process. Automatic request fulfillment with a complete audit trail. RES and TOPdesk partnered up in 2016 to help customers save time and money through efficiencies, driving increased productivity and a better user experience. When users request a service from IT, a manual process often follows that includes taking the helpdesk call, creating a ticket, multiple levels of email approvals, escalations to grant administrative privileges and email notifications. This is often called indirect fulfillment as someone is manually servicing the ticket. With RES, you can extend the TOPdesk capabilities to automate the entire user request process, so requests are directly fulfilled with a complete audit trail and no IT involvement. Users will be empowered to submit the request themselves directly from the self-service portal and the workflow engine takes over from there. This ensures all requests follow a predefined workflow process that is documented, secure and compliant. 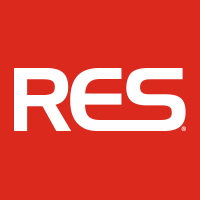 RES provides a fully supported connector that integrates RES solutions with TOPdesk to automate manual processes around fulfilling user requests. Not only can RES help with user requests, but IT can automate daily activities with increased control and better security and compliance, laying the foundation for IT as a Service. 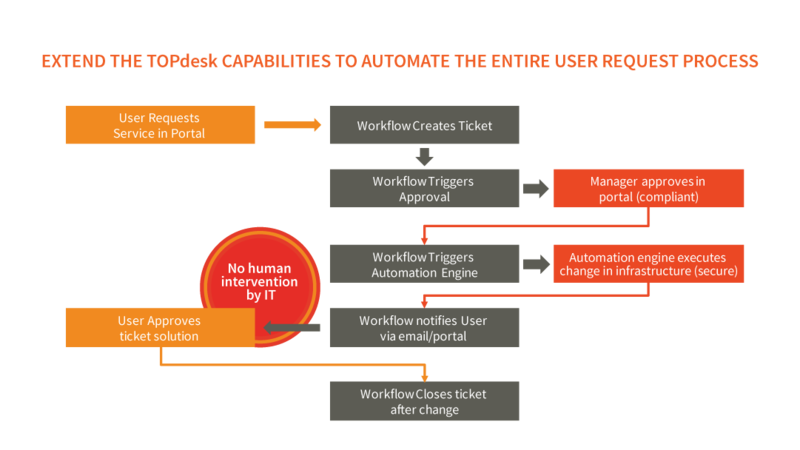 Faster Ticket Resolution timesReduce the time it takes for a user request to be fulfilled and ensure SLAs are met every time consistently. Cost ReductionCut helpdesk costs through workflow automation of request creation, approvals, infrastructure changes and notifications. Increase innovation resourcesFree up key IT resources by automating manual tasks and redirect them to more strategic or innovative projects. Reduce Risk and delaysStandardize and implement automation to remove the chance of human error or delay caused by exhaustive manual tasks and processes. Business Compliant processesguarantee automated processes are consistent and compliant with regulatory standards and directives. Secure procedures (less admin rights needed)Build security measures into the workflow and provide only the required credentials to complete the task. Predictable service deliveryTake advantage of a repeatable service model that improves productivity and elevates user perception of IT.